Every so often a weather event occurs that is so unusual and extraordinary, that it becomes forever engrained in the memories of all those who lived through it. Back on Halloween of 1991, a storm of this magnitude roared across the northern Plains. 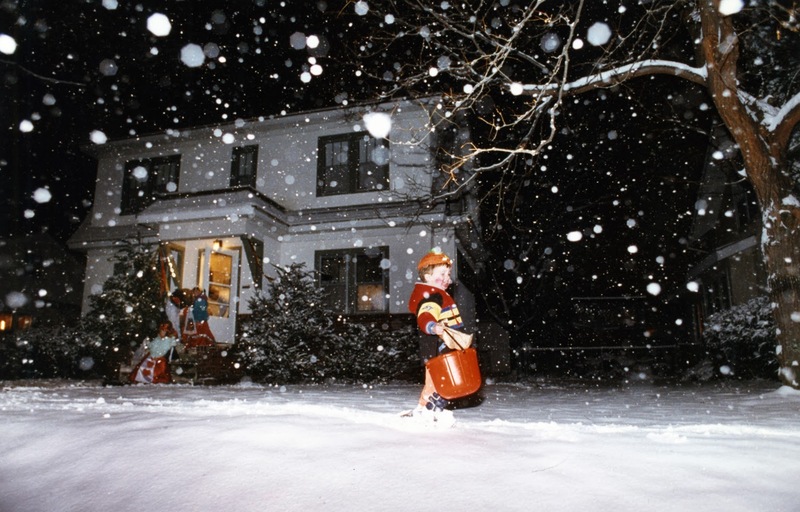 For many residents of the region, the "Halloween Blizzard" of 1991, became the benchmark upon which all snow storms would be measured against. To this day, no snow storm has been able to eclipse the memory of that unbelievable event, which brought much of the region to a standstill. This snow storm was not only characterized by record heavy snows over areas of MN and WI, but also by sheets of freezing rain that coated parts of southeast MN and IA. The heavy snow and icing that occurred in IA was so crippling that 52 of its 99 counties were declared in a state of emergency. Iowa also suffered further as the storm was responsible for 5 million dollars worth of crop damage, as many fields had not yet been harvested. As if the impacts of the freezing rain and heavy snow weren't enough to contend with, harsh winds and record early season bitter cold invaded the region for several days after the storm had exited. Some may think that measurable snow on Halloween is not that uncommon in MN. Surprisingly, since 1872 there have been only 6 Halloweens which have seen measurable snowfall in the Twin Cities. October 31st of 1991 still tops the list for snowfall received on that day, as 8.2 inches were measured at the airport. It's much more common to see highs in the 60s on Halloween rather than see any snow. In late October of 1991, few could have ever foreseen how the month would end that year. Late October of 1991, was also significant for fans of the Minnesota Twins. On the night of October 27th, the Minnesota Twins won their second World Series in 5 years, as they defeated the Atlanta Braves in a dramatic game seven in front of their home crowd. Little did they know they would soon be wielding shovels and ice scrapers in the same hands that were tirelessly waving homer hankies. The celebration continued full throttle into the 28th and 29th, as fans enjoyed mild highs of 63 and 65 respectively. On the night of the 29th, the tide quickly changed, as an abnormally strong cold front headed southeast across the area. This front kept highs in the low 30s for the rest of the month. The abnormal wealth of cold air for so early in the season helped set the stage for what was about to unfold. As the strong cold front built southeast into Texas, it eventually stalled as it reached the Gulf Coast. This led to an extremely sharp temperature contrast in east Texas, as 80 degree warmth in the Gulf of Mexico interacted with the early season chill behind the arctic cold front. When there is a considerable difference in temperature over a short distance, meteorologists refer to the area by saying there is a strong temperature gradient present. This tends to create volatile conditions as the varied air masses in close proximity to one another tend to create turbulence in the atmosphere. When this type of environment exists, subtle features that come into the region can have major repercussions. In this case, a modest upper level disturbance that headed east out of New Mexico initiated the first signature of the low pressure system that would soon become a raging tempest. The track of the low veered nearly due north out of east Texas, and eventually headed into central WI. As the storm moved north, it continued to intensify as a moisture-laden air mass from the gulf continued to build northward into the upper Midwest. Meanwhile, the bitter cold conditions remained just west of the low over MN and IA. This aided in the rapid intensification that the low experienced as it moved from western IL into the UP of MI. It strengthened so rapidly that the low reached the state of bombogenesis. Bombogenesis is a term that tends to be used most often with nor'easters rather than upper Midwest storms. The intensity of a surface low is measured by surface pressure, which is typically given in units of millibars. When surface pressure drops, the low becomes more intense. In cases where the surface pressure drops 24 or more millibars during a 24 hour period, the low can be referred to as a bomb cyclone. The resultant of most bomb cyclones is intense precipitation bands combined with very strong winds. Heavy snow combined with high winds created blizzard conditions across parts of the eastern Dakotas, as well as into eastern NE, IA, and MN. The heaviest snow fell just west of the surface low, as amounts of over 2 feet were common from Minneapolis into northeast MN. 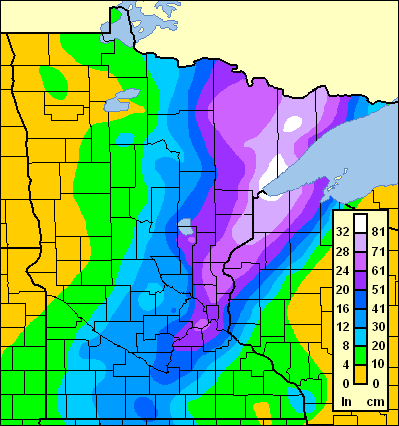 Duluth, MN measured the highest storm total, as the port city had the formidable challenge of digging out from under 36.9 inches. What made matters worse was the high winds that accompanied the heavy snow. Wind gusts periodically reached as high as 60 mph during the event, resulting in snow drifts of up to 10 feet high in spots. All of this led to numerous road closures across the region, as travel was nearly impossible. This still stands as the largest single storm snowfall for Minneapolis, as the total snowfall reached a whopping 28.4 inches. It also eclipsed the greatest amount of snow to fall in 24 hours for the Twin Cities, as 21 inches fell during the peak of the storm. These records have held strong in the years since, as no other event has been able to surpass it. Duluth's total of nearly 37 inches broke the state record for the most snowfall from any single storm. But in 1994, this record was surpassed when 46.5 inches of snow fell in northeast MN, near the town of Finland, from January 6th to the 8th of that year. Once the snow finally stopped falling, record cold ensued. This made for less than ideal conditions for road crews and residents trying to clean up the storms aftermath. The Twin Cities recorded its earliest subzero temperature on record on November 4th, when the mercury dipped to -3. Countless other records were broken due to the early season arctic outbreak that followed the epic storm. Because the initial snowfall was wet and heavy, the bitter cold that quickly followed helped form an insurmountable layer of ice on many of the roads and driveways that season. For some, that layer of ice and snow never went away until the belated spring thaw the following April. To this day, the "Halloween Blizzard" is a common topic at watercoolers and coffee tables around the region. Most folks have a story to tell as to what they were doing that ill-fated Halloween, when mother nature gave the greater scare than any ghouls and goblins could muster up that night.